A. Paul, a now full-time resident of Provincetown, Massachusetts, was born and educated in New York. Mostly a self-taught artist, A. Paul has studied and painted with several Provincetown master artists, including Joan Perreira, Rob Longley, and Anne Packard. His love for the diversity of the streets, the light of Provincetown skies, and beauty of the landscape of the Cape are often the subjects of his artwork. 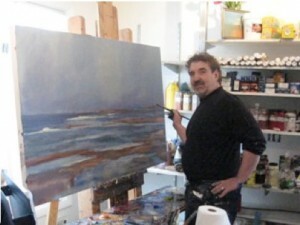 A. Paul’s work has been exhibited in New York, Canada and on the Cape. His works are among permanent collections in educational institutions, corporations and private collections worldwide. A. Paul’s artwork is available exclusively through Cortile Gallery and Cortile Gallery Artist Studios in Provincetown, MA.